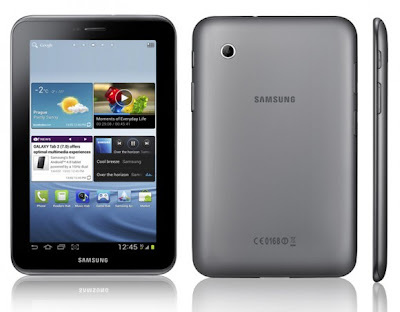 The Samsung Galaxy Tab 2 (7.0), the next one in serious of Samsung Galaxy Tab is equipped with the latest version of most advanced version of Android, Android 4.0 Ice Cream Sandwich. The Galaxy Tab 2 (7.0) is a seven inch screen that has 1,024x600-pixel resolution. Within the gadget it is equipped with 1GHz dual-core processor and 1GB of RAM. It also has 802.11n Wi-Fi and Wi-Fi Direct to link with other devices. Ice Cream Sandwich provides faster performance and new features such as Face Unlock, which unlocks the Tab 7.0 when you look at it. It has two cameras a 3 mega pixel camera at the back and the other second camera at the front screen for videos chats. It is also a very useful utility that provides opportunity to chat more than one person at a time through Google+ hangouts or one can indulge in the chat on the tab with ChatON instant messaging. Other important apps in the device include other Sansung’s range of HUB apps that help in connecting with ebooks and games. It Tab 7.0 also has a new video hub provided by Samsung, which provides about 1,000 movies to buy or rent. The tab has also Samsung's TouchWiz interface with lots of Hub widgets and a new service named S Suggest. S Suggest provides better ideas for new apps that one way prefer based upon the previous taste and ideas. AllShare gaming is also launched on Tab 2. Tab 2 allows to play, live-stream or transfer music, movies and games to Tablet from your PC. With this the Galaxy Tab is available in very wide and broad range including Galaxy Tab 7.7, Galaxy Tab 8.9 and Galaxy Tab 10.1. There's even talk of an 11.6-inch Tab for the tablet-using giant. The Tab 2.0 also provides a slot for a microSD card for an extra 32 GB storage capacity. And it is available in 3G to WiFi options and versions.